The Happiness Journey: Meaning and Joy in Florida! Ah, George Carlin. Since 2009, when I began following my personal and gross national happiness path, I’ve tried to wean myself off shopping. Among the many reasons to do so is a desire to get off the hedonic consumer treadmill. An even more powerful motivation came from Annie Leonard, whose “Story of Stuff” video first opened my eyes to the planetary and culturally destructive effects of thoughtless, wasteful shopping. Individually and collectively, we pay an unacceptably high price to accumulate possessions — much worse than merely taping sandwiches all over our hungry selves. Plus, stepping aside from a regular career path to follow my happiness calling dramatically curtailed my disposable income. Tellingly, my life satisfaction has risen. Partly, that’s because my shopping is in greater concordance with my beliefs. As I see it, corporate profit derived from constant pressure on all of us to buy, buy, buy is the leading driver behind climate change and income inequality. The less I buy of a whole host of products I don’t need, and never needed in the first place, the more I can release the corporate grip on my life — freeing me for a life lived in greater harmony with my values. Of course, it’s not that I don’t do any shopping. These are aspirational values, not always realized. However, I do strive to keep it local, used, or something I really want/need. 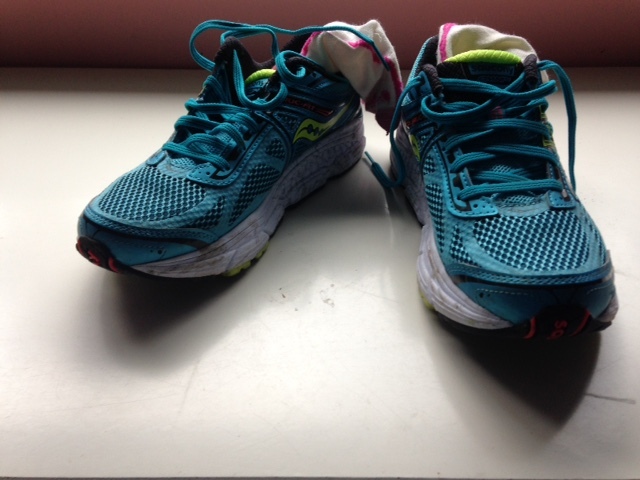 Which brings me to the brand new walking shoes pictured above. I haven’t bought new shoes for five years. But in a month I’ll be going on an internal and external journey, and, for both aspects, I need good shoes. You see, I will be rejoining The Happiness Walk for nine days and 100 miles through northern Florida in mid-September. And I know from previous experience that it is wise to invest in good shoes! I was last part of this adventure in October 2012 for two magical yet gruesome days (see this blog for a description). My heart and soul were singing, but my toenails were in the process of falling off. 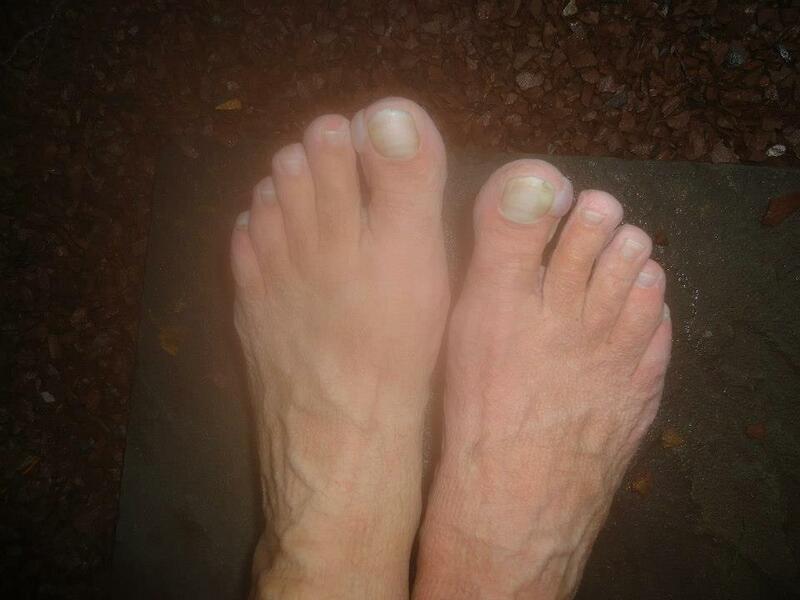 My very unhappy feet after two days of happy walking in 2012. This time, I decided to invest in decent shoes, as well as socks and moleskin to put on any budding blisters. Happiness may be an inside job, but we ignore the mind-body connection at our peril. It would be much harder for me to have a transformative internal journey if my feet were screaming in pain. Why Would Anybody Want to Walk 100 Miles Through Rural, Hot Florida? There are a lot of reasons not to walk, starting with the weather. Mid-September in Florida is bound to be hot, hot, hot — and humid to boot. Meanwhile, the Vermont weather I’ll leave behind will be glorious. September is quite possibly Vermont’s best month. Leaves are starting to turn, but we can still swim and kayak –though not for much longer! Knowing that time is running out makes Vermont sunny September days especially precious. Another reason to stay home is loyalty to my church, the Unitarian Church of Montpelier, which shuts down for the summer and will just be starting a new church year when I leave for Florida. My little family within the church is the choir. Last year was rough and sad for us. We not only sang but also cried together, throughout our beloved choir director’s terminal illness and death. Now, we have a really terrific new choir director. I want to be there with my choir family as we regroup and begin anew. Instead, I’ll be trudging through desolate Florida scenery. Hmmm. Interesting how the words “trudge” and “desolate” snuck into that paragraph. I guess part of me really wants to stay home! Maybe because I don’t want to leave my husband. And I don’t want to fly, because of the negative environmental impact. These are all important happiness considerations — exercising in nature, nurturing spirituality and community, cherishing my marriage, and taking climate action. Still, I am going, because the happiness factors from participating in the walk — for a short period of time, not the kind of commitment Paula Francis and Linda Wheatley have made — outweigh the happiness of staying home. First: Right Livelihood. Long before the advent of positive psychology research, Aristotle had a lot to say about happiness, including this: “Where your talents and the needs of the world cross; there lies your vocation.” The world definitely needs more happiness, well being, meaning, joy — whatever you want to call it, we need more of it. As for my talents, I spend a lot of time walking the happiness talk — but this is different. The Happiness Walk is about showing up, asking the right questions, and listening wholeheartedly. Fortunately, these are just the skills (talents, even) that have been honed in my mediation and coaching work. I love people, and am tremendously curious about everyone’s stories. Listening is something I can do, with my head and my heart. This is good work for me. It will make me happy. Positivity: Spending nine days listening to others — our hosts, people on the street, waitresses, anybody and everybody we meet — describe what makes them happy? And talking with them in turn about the happiness movement? It just doesn’t get any more positive than that. Engagement: From my (hopefully happy) toes, to my heart, soul and mind, I will be fully engaged with the task at hand. This is field research, as well as an opportunity to spread the paradigm-shifting gospel — both of which are at the core of my life’s work. Engaged? Oh, yes. Yes, yes. Relationships: This one is interesting. In her book Love 2.0, Barbara Frederickson talks about the “micro-bursts” of love that can occur between strangers. The Happiness Walk is just one big micro-burst of love after another. These relationships are short, but deeply meaningful. And of course, I’ll be growing my relationship with fellow walker and happiness activist, Paula Francis. Thus, relationships will also be a significant part of the experience. Meaning: Big time. I do this work because I believe firmly that the current gross national product (GNP) paradigm is trashing the environment, feeding the flames of greed and income inequality, and causing or exacerbating all kinds of wrong headed policies and actions on both the systemic and personal level. In other words, the happiness movement is urgently important. Meaningful? Yes, so much so that I am deeply grateful to have found this path. Accomplishment: No, and yes. I suspect that the work of building a movement will not be finished for a long time. Maybe never. Instead, I have to find my sense of accomplishment in all the small steps along the way (small steps, ha ha ha). When my part of the walk is over, I will feel very accomplished! And very happy. The Rat Race. This quadrant can be all about meaning, but doing the work in such a single minded way as to leave little time for all else that makes life enjoyable. While being in rat race mode for a time is okay, it is insufficient to lead a thriving life. Hedonism. This, of course, is all about the pleasure. I imagine most of you, like me, have indulged in hedonistic episodes (a.k.a., vacation!). Again, this is fine in spurts. But a hedonistic lifestyle is shallow and also insufficient for a thriving life. Nihilism. In this sorry quadrant, one has neither meaning nor pleasure. This is a bleak life. Let’s get out of here, fast! Happiness. And the winner is, that sweet spot where one has a balance of meaning and pleasure. We are physical as well as spiritual beings who need both purpose and joy to thrive. And thrive I will, my friends, at least during the happiness walk when I will be solidly in this most desirable quadrant. Fourth: Self Concordant Goals. Now, how about a little Nietzche? He said, “when there is a what for, every how becomes possible.” The what for is, once again, meaning — but we also need the how, we need to take action, we need goals. There are some caveats here. First, the happiness of goals lies in the journey, not in arriving at the destination. It’s about being in the present and knowing where you’re going, and why. This seems a particularly apt point for my upcoming participation in The Happiness Walk, since it is literally a journey. Though my final destination is Live Oak, Florida, that destination is not at all the point. It is definitely the day-to-day, one-foot-in-front-of-the-other journey that excites me. So, once again, while Paula and I don’t yet know where we’ll be spending the night for most of the time I’m walking with her, this much is clear: following this happiness path seems destined to make me a happier person. Paula, too, I’m pretty sure. And the beautiful thing is, the listeners — in this case, the Happiness Walkers — will get just as much happiness as those who are sharing their stories with us. All this and more … reason enough to leave Vermont in September. In fact, the connections will be so powerful, I will likely want to keep walking. Fortunately, there will plenty of happiness arguments to compel me to come home because, you know what? Happiness is where you look for it. Too Much of a Good Thing, Or Where Did I Put My Air Mask? Mediation or Meditation? Which Is My Happiness Path? Eventually the walk will end up in your part of the world! Maybe you can be part of the fun then! So glad you’re doing this, Ginny! I love following your blog and your journey – figurative and literal! Let me know your path – I know lots of people in Florida who might like to give you two shelter for a night. Thanks Roni! I’ll send you an email with our route. That would be so helpful!